Below is an excerpt from my latest LongmeadowBiz newsletter that I sent to 900+ local subscribers on October 24. Little did I did I realize that within one week of sending this newsletter our town would experience one of the worst weather events to hit this region during the past 50 years and the potential value of Facebook would unveil itself. What does Facebook mean for Longmeadow? I believe that a Facebook community fanpage is an excellent means for sharing information. One important thing to remember is the speed at which information can be shared. Our town website at www.longmeadow.org is not staffed nor designed to be an effective communications tool. About one year ago I developed the Longmeadow Community fanpage (facebook.com/longmeadowbiz) to demonstrate to town residents how we might be able to dramatically change how we communicate with each other. If there was a weather event in Longmeadow similar to one of the storms that hit surrounding areas this past summer, Facebook would be an ideal way to share information with town residents. It would be much better and faster than town website announcements (or emergency phone calling) because of its 2-way communication. Residents needing assistance could post comments and/or photos so that town's public safety officials (police/ fire/ DPW) could monitor and respond more quickly. Reporting of information on Facebook (and other social media as well) is typically 15-20 minutes ahead of the traditional media reporting. This could be very important during an emergency. The really great thing about Facebook is its ability to reach so many people so quickly. My initial target is to gain at least 1500-2000 Facebook fans for the LongmeadowBiz fanpage. Currently, there are 280 fans but the INTERACTIONS have been relatively low so the reach of the information is far below its potential. With greater INTERACTIONS by the existing fans (such as clicking on the Like icon or making a comment), the reach of the information will become much greater. Our Connect CTY system- an automatic high speed phone system was a great asset to Longmeadow officials in communicating information to town residents during the emergency that we recently experienced. However, many residents were either not registered or were without phone service so they did not receive these important calls. Our town website- www.longmeadow.org was not a reliable source to obtain up-to-date information through this difficult period. 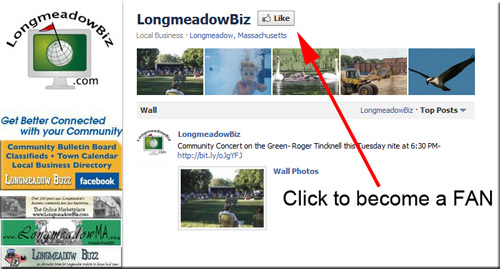 The Town of East Longmeadow has an “official” Facebook fanpage. East Longmeadow’s fanpage has almost 1500 fans. A quick check of the information that was recently posted and the interactions that took place between East Longmeadow officials and their town residents easily demonstrates the value of Facebook during such an emergency situation. Longmeadow needs a multitude of methods to communicate information especially during an emergency. What we currently use does not work. As more and more people purchase and start utilizing “smartphones” and have Internet access “in the palm of their hand”, Facebook should be considered a vital communication tool. Please take a look at the new Longmeadow fanpage (facebook.com/longmeadowbiz) to see if the posted information is of interest to you and your friends. If it is, click on the "Like" button to become a FAN. Share information that is useful with fellow town residents. If you are interested in receiving the LongmeadowBiz newsletter that is published about 4-6 times per year, simply visit www.LongmeadowBiz.com and use the easy signup form. When you add these to definitions together, you get a thrilling, on the edge of your seat, “How did that happen?”, football game played by two intense rivals. On Saturday, November 19th, the rivalry gets pushed aside in a show of unity for their fellow man, the players of the East Longmeadow Spartans and the Longmeadow Lancers football teams will join forces to orchestrate a two-community wide Selectmen’s Cup FOOD DRIVE to benefit the Open Pantry of Greater Springfield. The FOOD DRIVE takes place from 9 am – 2 pm at The Longmeadow Shops parking lot in Longmeadow and the Stop and Shop in East Longmeadow. Players will be on hand to accept donations on behalf of the Open Pantry. Also, TD Banknorth branches in East Longmeadow and Longmeadow are accepting donations as well, as part of the Selectmen’s Cup Food Drive. Not wanting to miss out on the fun, students at East Longmeadow High School and Longmeadow High School are participating in the Food Drive by collecting items this week at school to add to Saturday’s total. Below is a slide show of photos from my front and back yards as well as my neighborhood after the Halloween snowstorm on October 29-30. Our neighborhood was quite fortunate with no personal injuries nor significant property damage- just a lot of tree damage. Most of us were without power for six days. Kudos to Fire Chief Eric Madison, Select Board Chair Mark Gold, Select Board member Paul Santaniello and other town leaders who decided early (Monday, October 31) to engage the services of Ashbritt Environmental to cleanup our town. As highlighted in an earlier story, the total cost is expected to be ~ $13.2 million with Longmeadow's share after reimbursement to be ~ $3.3 million. When finished the indirect cost to the average homeowner/ taxpayer will be ~ $600- which is quite a reasonable cost given the enormity of the cleanup effort (expected to be ~ 250,000 cubic yards of debris). Most of the storm debris cleanup is expected to be completed by December 31. The large trucks (County Waste) can be spotted all over town picking up the debris and hauling it to the Wolfswamp Road fields for processing into wood chips (see video). My wife and I watched in amazement as one of the trucks picked up the storm debris in front of house.... one large step forward toward normalcy in our neighborhood which was hit pretty badly during the storm. After watching the collection process I was simply amazed at the great skill demonstrated by the Ashbritt employee who removed the large amount of debris with only minimal damage to my front yard while at the same time avoiding the overhead power, cable and phone lines. I believe that consolidation of utilities under one umbrella makes good financial sense for our town. Increased purchasing power for the "entire town" so that we can negotiate lower rates. If this is combined with tracking of energy units for all school and town buildings as suggested by Curt Freedman at last night's meeting, we should be able to more easily identify additional cost savings. Last night (Special Town Meeting, 11/08/11) it was interesting to watch the extremely strong opposition expressed by School Committee chair to retain budget line items that are clearly not aligned to their primary mission of the School Department which is the education of our children. The School Committee is not held accountable if energy costs unexpectedly go higher and the budgeted energy monies are insufficient. However, if there are energy/ utilities savings due to a mild winter and/or energy conservation measures, the saved money is not directly returned to the town's general fund but can be shifted to a different line item for other uses by a simple SC vote. If there was consolidation of town and school utilities, these savings would return directly to the town's General Fund since line item transfers on the town budget are not allowed. I understand that according to the opinion of our Town Counsel, consolidation of utilities under the Town Manager is in accordance with our Town Charter. The Town Manager's budget instructions for FY2013 states a separate utilities budget for all town buildings including the schools will be established. It sounds like we haven't heard the end of Article 4.... perhaps only for the current FY2012 budget year. At the special Select Board meeting on November 10, costs for the tree debris cleanup from the October 29-30 snowstorm were discussed. Below is a video clip from this meeting during Fire Chief Eric Madison provides Select Board members with an estimate of the cleanup costs. The total cost of cleanup is estimated to be ~ $13.2 million of which the town's share after reimbursement by FEMA is expected to be $3.3 million. Longmeadow will need to pay the entire cost of $13.2 million upfront and then await reimbursement by FEMA. 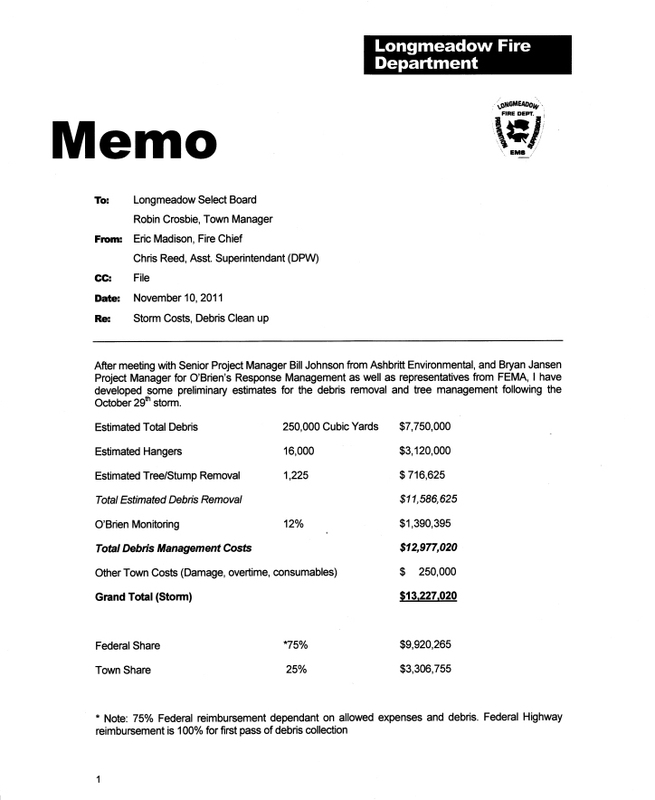 Paul Pasterczyk, Longmeadow's Finance Director has done his homework and it appears that the cash flow squeeze can be managed without dramatically affecting the town's operation. In the video clip shown above Mr. Pasterczyk describes the various financial options available to the town. Interestingly enough, one approach that would not be approved by the Mass Dept of Revenue is the use of available cash from the new HS project bond. Jonathan David of MassTree- made comments at last week's special Select Board Meeting (11/10/11) stating that he has witnessed widespread price gouging by certain companies engaged in tree and debris removal services within the town of Longmeadow. In the video clip below he asks that our elected officials as well as the Police Department take an active role in protecting the residents of Longmeadow from such abuse. Price gouging is a term referring to a situation in which a seller or service provider prices goods or services much higher than is considered reasonable or fair. In precise, legal usage, it is the name of a crime that applies in some of the United States during civil emergencies. I've known Mr. David for quite some time and he has completed a number of tree removal related projects on my property. His expertise and that for his team is high and his prices are fair. A similar price gouging situation took place last winter when many town residents feared for the personal safety of their families because of possible roof failures caused by the large amount of snow. There were a number of instances where companies and individuals charged exorbitant prices for their snow removal services. In a possible response to Mr. David's call to action, our Town Manager issued the following press release earlier today which I would consider a "too little too late" passive action. "Please be cautious when hiring tree service companies or other disaster recovery services. Make sure they are reputable firms. Contact the Better Business Bureau at 508-755-2548 or www.bbb.org or the Attorney General's office at 617-727-8400 for information." Here is a link to the TM's full press release. I would urge the Select Board to take some stronger action on this issue.